Skinless chicken breast fillets with a sundried tomato and Manchego cheese melt, with grilled red and yellow peppers and sliced chorizo pork sausage. 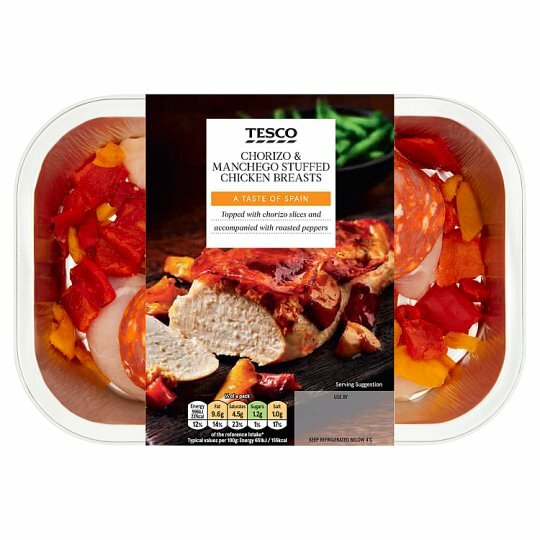 INGREDIENTS: Chicken Breast Fillet (72%), Chorizo Pork Sausage (5%) [Pork, Water, Flavouring, Salt, Smoked Paprika, Dextrose, Garlic Paste, Antioxidant (Sodium Ascorbate), Preservatives (Sodium Nitrite, Potassium Nitrate), Nutmeg, Oregano, Starter Culture], Red Pepper, Yellow Pepper, Full Fat Soft Cheese [Cream (Milk), Water, Dried Skimmed Milk, Cornflour, Buttermilk Powder (Milk), Sea Salt, Starter Culture], Cream (Milk), Water, Tomato, Tomato Paste, Manchego Full Fat Hard Cheese (Milk), Sundried Tomatoes, Cornflour, Salt, Garlic Purée, Basil, Sunflower Oil, White Wine Vinegar, Butter (Milk), Lemon Juice, Black Pepper. Instructions: Chilled: 200°C /Fan 180°C/Gas 6 30 mins Place foil tray on a baking tray in the centre of a pre-heated oven for 30 minutes. Caution: This product contains raw meat..Caution: Although every care has been taken to remove bones, some may remain.